I must confess that I never particularly liked the German gastronomic magazines. A huge number of these fall either in the recipe collection or lifestyle groups: neither interest me much. I would have enough recipe to test to keep me busy for the next 15-20 years if I wanted to. The lifestyle magazines IMO aim at those who would want to be there – with the cool cars, perfect designed homes and clothes, drinking incredibly expensive wines – but are not rich and or sophisticated enough to live that life. The only "real" food magazine to my eyes (at least among those widely available), Feinschmecker, always gave me the impression of being a food for show-offs kind of publication. I do occasionally buy it, but I have never went through a single issue without feeling terribly pissed off with one article or the other. Especially when people like Wolfram Siebeck, one of Germany's finest gourmets pens, go on with their spiel about how German haute cuisine is superior to others, even the French. Having read the same things in Italian magazines for ages, I know all too well what prejudiced and delusional culinary national pride hides behind this chest thumping, and I cannot avoid getting mad about it. 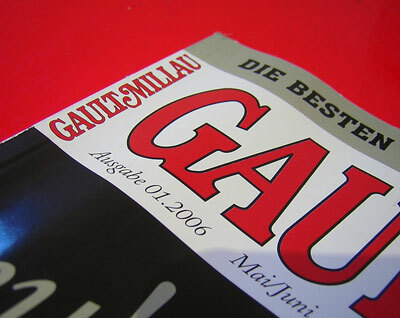 Last week my attention was grabbed by a new addition to the usual suspect on the cooking shelf of my newsagent: the bi-monthly German Gault Millau magazine. Had I missed this in the past five years all the time? No, GM magazine is a new publication. I grabbed one with the secret hope of having finally found what I had searched for. I have long had a greater sympathy for Gault Millau guides than the haughty Michelin ones with their stars falling from the heavens without a word of explanation, so I was favourably inclined to this magazine. It was only a matter of time. After food TV, gourmet kitchenware and not last food blogsit had to happen: the animated gourmet movie. In summer 2007 Pixar will be releasing Ratatoille, a computer animated movie centered around the adventures of a gourmet rat living in the sewers of Paris. Just had a look at the trailer: the movie promises to be real fun for both food lovers and food slobs. You can bet I will be there when it comes out. See the Quicktime trailer here. Previous Identità Golose posts: Intro, Part1, Part2. The original of the article below, in Italian, can be read here. 3:00 PM, Milan's Stock Exchange: appointment with haute cuisine. Creative, exaggerated and avant-garde: Spanish cuisine continues to ride the media wave that is overrunning kitchens, chefs, journalists and simple food-lovers. Not surprisingly given haute cuisine's nature as fertile ground for experimentation, braveness, and for imagining ideas that can turn into full-fledged trends. For this reason someone like Ferran Adrià needs no presentation. Time Magazine included him in the list of the 100 most influential people in the world. Adrià reinvents himself for each opening season of his El Bulli restaurant giving way to a creative madness that has foodies humming with pleasure, between charme, genius and provocation. Previous Identità Golose posts: Intro, Part1. The original of the article below, in Italian, can be read here . 11:00 AM. Jordi Herrera is busy in downtown Milan desperately seeking the fifth essential element needed for the dish he is going to present and is substituted on stage by the young Italian chef Alfredo Russo. The newcomer, chef of Dolce Stil Novo near Turin, presents an unusual and thought-provoking talk: The difficulty of doing easy things well. 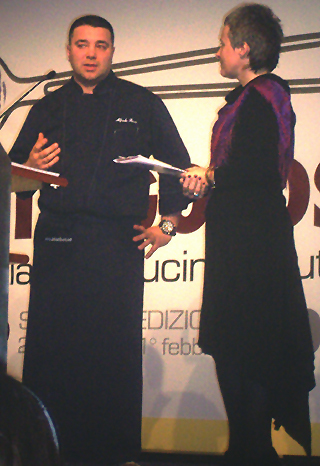 The starting point of Russo's cuisine is the daily routine and his surprising ability to absorb the terroir of Piemonte through the most common views, smells and sounds and then use them, putting them above the Italian-peninsular traditions, in a contemporary fashion to obtain a cuisine that is modern in its concept rather than in its use of technology. The Introduction to Identità Golose is here. 9:30 AM. 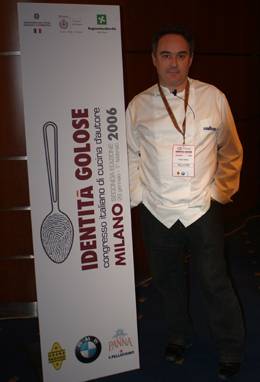 Fulvio Pierangelini is the opening speaker of Identità Golose. His talk, titled Pensieri Semplici-Simple Thoughts,is dedicated to "an egg and a pig", simple ingredients therefore, that make, in Perangelini's case, Italian cooking great. The core of his talk is completely dedicated to the importance of ingredients, his cuisine made up more of skilful steps than of technical tricks. Pierangelini's aim is to bring the ingredients he uses to the edge of quality and to obtain this goal he is willing to go through a natural and intimate process. It is a difficult path which at times risks lack of understanding. It is also a steep road for Pierangelini: before coming into the kitchen, it starts in the countryside. For those less familiar with Italian cuisine and its celebrities let me give an extremely brief introduction to Fulvio Pierangelini. Though little known to the English-speaking public, Pierangelini is considered one of the best, if not the best Italian chef by the national press and part of the French and Spanish gastronomic critics. His restaurant, Il Gambero Rosso in San Vincenzo ,on the Tuscan coast, is no.1 in Italy for both the Gambero Rosso and Espresso guides, has two Michelin stars and is a place of pilgrimage for his many fans. 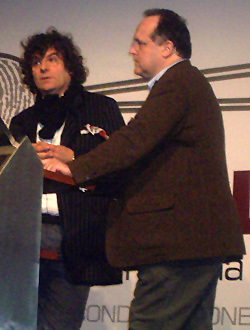 Pierangelini's style is unique and has developed pretty much autonomously of major external influences, and like Pierangelini's character, it does not try to please at all costs or follow the fashion of the moment. For the next few days Il Forno will host the English version of the report my good friend Muccapazza (from Il Gastronomo Riluttante) will be doing from Identità Golose, arguably the most interesting event dedicated to fine cuisine in Italy. For once I'll give up my role as author and translate the material that Muccapazza will write in Italian. I hope those interested in Italian fine dining will enjoy our combined effort. The original post in Italian can be found here. Between the end of January and the beginning of February, Palazzo Mezzanotte in Milan will host Identità Golose and Dossier Dessert. In contrast to the first edition of the event, this year what will effectively take place is two congresses in one: both aspects underline one moment of the meal, each with its own identity, savory and sweet. The desire is to give way to a meeting of the savory and the sweet world, two realities that have problems understanding each other on the day to day practical basis of restaurant kitchens. According to Paolo Marchi, the man behind Identità Golose, time has come for these two realities to talk to each other, building a bridge between them and possibly even to the world of pastry shops working outside the restaurant logic and rhythms. Identità Golose will be a meeting that will offer three days between savory and sweet "identities", livened up first by chef ready to confront themselves, discuss and think together for two days (30th and 31st January), and then, on the same stage, by the pastry chefs, who'll close the event on the 1st of February. Dossiert Dessert will be the so called cherry on the cake of Identità Golose: Monday 30th of January will be completely dedicated to ice creams, the next day will be dedicated to a special program studied by Valrhona for the occasion, dedicated to the study of a dessert menu, without being exclusively dedicated to chocolate. And the 1st of February? It will be a surprise. Sweet and savory, clearly. Fascinated by Pierre Hermé's work but unable to fly to Paris and taste his creations in the flesh? Now you can at least have a peek on the newly-launched website: pierreh5. Absolute foodporn. ... or: Italian journalists and schadenfreude. Mr Blumenthal promptly re-organised his kitchen, improved his thermometers, and cracked down on possible cross-contamination. He also hired an independent food safety consultant. As it is, further test carried last May and July showed no problems whatsoever. Enter the Italian press: La Repubblica decides to report the news. After all the Fat Duck has won the "Best Restaurant in the World" award from UK Restaurant Magazine. Repubblica reports the news, complimenting The Guardian for their honesty (Blumenthal writes for the paper), but makes a laughable mistake, calling him Sidney. Or does Heston have a twin brother? Had this been the end, it would remain a silly mistake in an altogether not memorable article. Instead the news gets picked up by Stefano Bonilli, Editor in Chief of Gambero Rosso magazine, on his Papero Giallo blog and Paolo Massobrio of Club di Papillon, a rather important gastronomic society in Italy, in their newsletter. Both do a really bad job in reporting the news. Massobrio writes that Blumenthal's test results are from a few days ago and Bonilli titles his post "Disqualified". Great job for giving the false impression that The Fat Duck has serious food safety problems. All this ignoring, willingly or because of ignorance, the successive thorough measures introduced in the restaurant's kitchen to overcome this problem, something that would deserve a praise in my book. Bad journalism? Or just schadenfreude? The Fat Duck winning the Best Restaurant award and Italian restaurants faring pretty badly probably still burns. 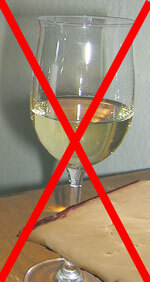 The Italian gastronomic press often accuses foreign reporters of being superficial and not well informed when writing about the Italian food scene. What should one say if some of the most important Italian journalist in the field behave the same way towards news coming from across the Alps? Maybe they should take a lesson from the people over at gustoblog.it who criticized the article with clear arguments.